Disclosure: I previously worked with eastasiasoft in a freelance capacity on Rainbow Moon. I have had no involvement in the development of Lost Sea. Lost Sea is the sort of game that reminds me why I don’t really like roguelikes all that much – because of both what it does well and what it doesn’t. It’s essentially an action-adventure game with all the roguelike trappings – permadeath, procedural generation, sudden difficulty spikes – but it sets itself apart simply by bringing a fresh setting and theme to the genre. I can’t think of a roguelike I’ve played that wasn’t either science-fiction or fantasy, and almost always the dark, brooding variants of those. Lost Sea, on the other hand, plants on an archipelago of tropical islands in an alternate dimension after being caught up on a storm over the Bermuda triangle. 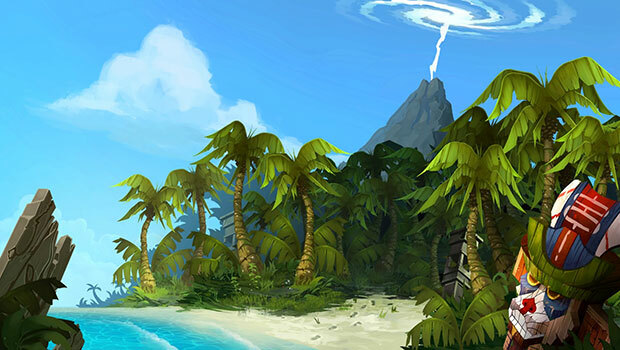 Instead of grimy dungeons or lifeless spacefaring behemoths, Lost Sea has you exploring lush, vibrant islands with one of a number of nameless explorers, including an Amelia Earheart lookalike, a salty sea captain, a beardly man in a loincloth, and a woman with a Camen Sandiego-like fedora and trenchcoat combo. In all honesty, my main motivation in Lost Sea wasn’t so much to overcome its challenges and “beat the game”, but simply to see what visual feasts each new level would hold. A fairly typical tropical paradise gives way to an arid desert, a gloomy swamp, a snowy tundra, but even these locales, which could so easily be dull and bland, bring their own sense of life and vibrancy. The desert and tundra are home to beautifully silly cacti and snowpeople, respectively, while in the swamp, you’ll find toads that you just know will get you higher than a kite should you lick them. Speaking of licking toads, the final section, Atlantis, is a psychedelic treat for the eyes; full of blue, pink, and purple shrubbery and bizarre alien artifacts. The use of colour throughout Lost Sea is impressive, but Atlantis is the real treat and makes the effort of getting to that point more than worthwhile. Make no mistake, effort is what it will take. You will die, and you will lose all progress you’d made as far as powering up your character goes. It will be frustrating, and the small concession of gold and experience you get on the subsequent run will almost feel like a kick on the teeth. If you made it far enough to get to the next section of the archipelago, you’ll be able to warp to the start of that section, but that’s cold comfort when you’re dropped into a tougher area with none of the upgrades that helped you get there. Amid the growth of “roguelites” that lay some sort of meta progression system over individual runs, Lost Sea stands out as a game where “permadeath” actually means losing pretty much everything you’ve gained. As such, roguelike purists will probably be a lot more receptive to what this game offers than everyone else. Maybe I’m just some sort of “coddled modern gamer”, but I like the mechanical sense of progress that comes from checkpoints, levels, and unlocks. I can see the appeal of the accomplishment and mastery that well-designed roguelike entails, but for me, the loss of progress is grounds for little more than frustration. That’s something that Lost Sea reminded me often. I could rarely play more than one or two runs in a sitting before the weight of major setbacks and the feeling that the last hour of play, sometimes more, had been for naught set in. “I have to do all of that again?” I’d think to myself, as I turned off the game and switched to something more willing to concede to my need progress bar – based gratification. This was only amplified by a general repetitiveness to Lost Sea’s core mechanics. There are some great ideas at play here, but the feel like the needed to be fleshed out a bit more. As you work your way through the islands, you’ll find other survivors who you can recruit, each with up to four random abilities that can aid you in your exploration. Carpenters can fix damaged bridges, for example, while locksmiths can open chests. The problem is that these abilities are few and for the most part inconsequential – as long as you have one locksmith and one carpenter (who can be the same person), you’re golden; anything else you get is just a bonus. Experience boosts and damage boosts are nice to have, but they don’t really change the game in any meaningful way. In a way, that’s a blessing, because your companions really take more effort to keep alive than they’re worth, especially late in the game. They simply follow you around like lemmings, heedless of any danger they’ll get themselves into. Sometimes this makes for interesting little puzzles in itself as you try and carefully manage the movements of up to four followers; other times, it simply means that you have no choice but to let them get dropped. It’d be frustrating if they weren’t so disposable. The levels themselves are initially varied and captivating, but it doesn’t take long before the curtain is drawn back and you can see the cogs of the procedural generation at work. Each island is made up of a randomised collection of hexagonal pieces, but the number of unique elements is small, so it doesn’t take long before it feels like you’re just retreading old ground with each new island. Even the changes in scenery as you move from one area to the next don’t bring anything new to the maps, other than the cosmetic changes. The exception to this is in the enemies you face, which switch up often and mark huge difficulty jumps. None of them are particularly complex, but they can make quick work of you if you’re not careful, especially in later levels, and lady luck will often have a role to play, as certain configurations or big groups can be particularly trying. Success in combat comes down to knowing enemies, how they attack, and the best, safest ways to deal with them. For all my whinging about progress and the harshness of permadeath, Lost Sea does a good job of the “fail, but fail better” brand of difficulty so popularised by Dark Souls and its ilk. As frustrating as it can be to lose all your stuff, each death is a learning experience. Simple as it may seem, this is something that a lot of games struggle with, but Lost Sea gets pretty much spot on. Lost Sea is developed and published by eastasiasoft. It’s available now for PlayStation 4, Xbox One, and PC. A press copy was supplied by eastasiasoft for this review.